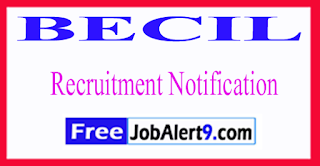 BECIL (Broadcast Engineering Consultant India Limited) Has Released Recruitment Notification For 10 Database Administration, Project Manager Posts. All Eligible & Interested Candidates Can Apply Offline On Or Before 26-06-2017 (26th June 2017). Further Detailed Information Regarding Educational Qualifications, Age Limit, Selection Procedure, Exam Pattern, Syllabus for BECIL (Broadcast Engineering Consultant India Limited) Recruitment 2017 - 10 Database Administration, Project Manager Post is mentioned below. Rs. 75,000/- (Post 1), Rs. 60,000/- (Post 2), Rs. 38,000/- (Post 3), Rs. 32,000/- (Post 4), Rs. 28,000/- (Post 5), Rs. 22,000/- (Post 6) . All Eligible & Interested candidates Can Download application Form through official web-site (http://becil.dealnxt.com). After Filling The application form, candidate must send by hard copies of application a long with relevant testimonials (Mentioned In Detailed Advertisement) to the following Address before / (26th June 2017). Assistant General Manager (HR) in BECIL’s Corporate Office at BECIL Bhawan, C-56/A-17, Sector-62, Noida-201307 (U.P) . Last Date to Submit Hard Copy of Application Form Is -26-06-2017. Click Here For BECIL Recruitment 2017,Advertisement. 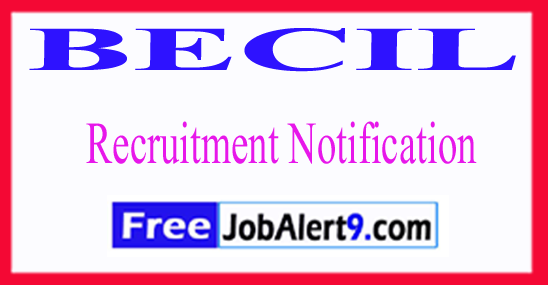 BECIL (Broadcast Engineering Consultant India Limited) Has Released Recruitment Notification For 06 Graduate, Diploma Apprentice Posts. All Eligible & Interested Candidates Can Apply Offline .Further Detailed Information Regarding Educational Qualifications, Age Limit, Selection Procedure, Exam Pattern, Syllabus for BECIL (Broadcast Engineering Consultant India Limited) Recruitment 2017 - 06 Graduate, Diploma Apprentice Post is mentioned below. Candidates should have done Diploma / Engineering Degree or its equivalent qualification from a recognized university. Rs. 4984/- (for Graduate Apprentice), Rs. 3542/- (for Diploma Apprentice) . All Eligible & Interested candidates Can Download application Form through official website (http://becil.dealnxt.com). After Filling The application form, candidate must send by hard copies of application along with relevant testimonials (Mentioned In Detailed Advertisement) to the following Address before / (26th June 2017). BECIL Regional Office , # 162, 2nd Main Road, 1st Cross AGS Layout, RMV 2nd Stage, Bengaluru- 560094 . End Date To Submit Hard Copy of Application Form Is - 26-06-2017.